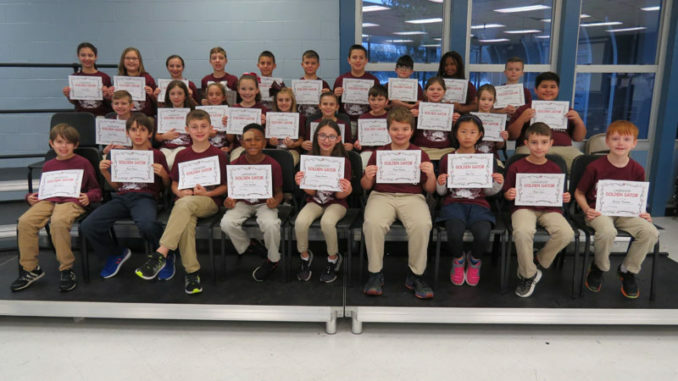 Bottom row: Ryder Young, Rhett Parker, Brayden Farrell, Trace Narcisse, Ashlyn Andras, Mason Propps, Amy Chen, Simon Spitz, and Brennan Thompson. Middle row: Aaden Money, Taylor Walsh, Jalynn Todesco, Ava Knowles, Harper Dufrene, Beau Williams, Noah Martin, Isabelle Guillot, Juliana Savoie and Slade Palahang. Top row: Sarah Waits, Kaitlyn Waits, Emma Mills, Preston Lemoine, Ethan Arellano, James Franks, Carter Burns, Thomas Bradshaw, Irelon Simms and Anthony Baril.